Tickets £10.00 on the door. No reservations. Please see www.orpingtonjazzclub.co.uk for full details including map. Free parking and a CAMRA award winning bar. 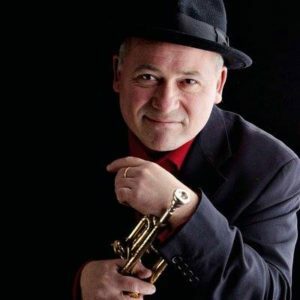 Considered one of today’s finest trumpeters, Enrico Tomasso is a regular nominee at the British Jazz Awards, and has taken the award for best trumpet in 2012 and 2013. Ernie Tomasso, nurtured and encouraged his inherent talent and gave him every opportunity to hear and meet many jazz greats such as Benny Goodman, Roy Eldridge, Oscar Peterson, Buddy Rich, Dizzy Gillespie, and the Basie and Ellington bands. His biggest inspiration was Louis Armstrong who he met and played for during Louis’ visit to Britain in 1968. This led to a correspondence and friendship until Louis’ death (You may have seen some of Enrico’s TV interviews about Louis). Ray Gelato’s Giants. Having a wide stylistic range, he has a busy studio career, including working with Clare Teal, the film composer John Altman, and also Bryan Ferry, featuring both on the latter’s CD As Time Goes By, and with the Bryan Ferry Orchestra on the album The Jazz Age as well as the soundtrack for Baz Luhrmann’s recent film adapation of The Great Gatsby (2013). With an international reputation, Enrico is one of the major players on the British jazz scene as can be seen by listing just some of his recent collaborations which include those with Scott Hamilton, Marty Grosz, Warren Vache, Dan Barrett, Ken Peplowski, Bucky Pizzarelli, John Barnes, Acker Bilk, Keith Nichols, the Pizza Express All Stars and Alex Welsh Remembered. He has also featured in the big bands, Echoes of Ellington, taken the Roy Eldridge role in the Gene Krupa Big Band tribute, and performed his own tribute to Louis Armstrong, Salute to Satch. An exciting stage presence and a lively personality, combined with Enrico’s fine command of his instrument and stylistic invention place him among the finest jazz stars of today.